In 1983 the world received its first glimpse at Walt Disney Productions’ Mickey’s Christmas Carol. 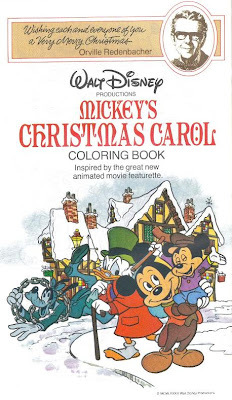 That winter, whenever you purchased two jars or bottles of Orville Redenbacher products you were entitled to a free Mickey’s Christmas Carol Coloring Book. Inside were fourteen pages of blank magic waiting for the keen eye of a child and freshly sharpened crayon. 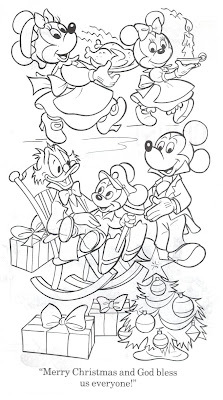 Here is one page, of perhaps the most recognizable scene from Mickey’s Christmas Carol, that is sure to keep your pint-sized artists occupied while you shop for gifts to go under the tree. Thank you - I totally love these posts when there is something we can colour in! I'm a big kid when it comes to things like that.